I love Island Princess' snacks. They make so many yummy snacks right here in Hawaii! My favorites are the Mele Macs. They are so delicious and addicting! I often give them as gifts to friends, family, and colleagues on the mainland. In addition to their very popular Mele Macs, Island Princess offers Choco Mochi, Caramel Popcorn, Chocolate Covered Coffee Beans, and so much more! You can read Nadia's review of several of Island Princess' products here, and also check out a yummy recipe using the Mini Mele Macs here. Island Princess Hawaii's products definitely makes a great snack or gift! 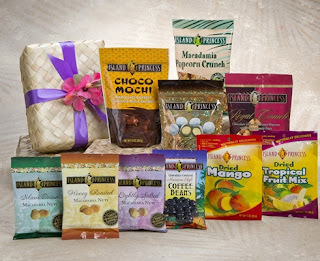 Win: One lucky winner will receive an Island Princess Mahalo Nui Loa Gift Basket (ARV $60). To enter, comment on your favorite Island Princess Hawaii snack, or the snack you'd most like to try. The deadline for entries is June 18, 2015 11:59pm HST. If you submitted an eligible entry and it is chosen by random.org as the winner, you will be notified via email on or about June 19, 2015 (make sure your email address is in your profile or comment and be sure to check your junk/spam, etc. folders) and will have 3 days to respond.